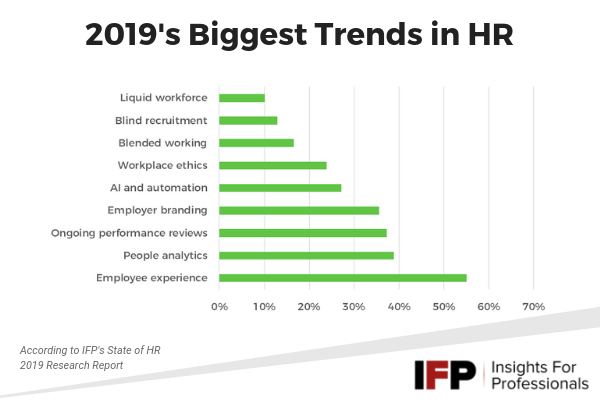 New year, new trends... which HR trends should you keep an eye on this year? Technology and HR are increasingly linked through the digitalization of records and worker management. As new trends help shape how HR attracts, hires and manages the workforce, technology offers a constantly changing landscape of opportunities for investment and discovery. To determine what would be popular for 2019, we asked our audience which trends they wanted to know more about. Whether your business is a part of the global economy or focused on a purely local market, the most popular trend remains building a valuable employee experience. A growing range of IT-led tools help companies create enjoyable and valuable employee experiences across a range of aspects. These include creating employee understandable engagement tools, growing a transparent and vibrant culture within the business, creating a focus on wellness, fitness or health, and allowing for open feedback and performance reviews. Adopting or creating tools to manage and encourage adoption of these aspects is key to any progressive business success, now and into the future. Building these tools is nothing without accurate and understandable analytics. From feedback tools on computers or smart devices to surveys and performance data points, as well as measuring efficiency and timeliness, the business cannot plan or react if it lacks good analytics. People analytics helps develop a more strategic approach to talent-based decision making, improving the whole hiring and management process. While some workers may fear a data-driven approach, and many HR departments are taking their first steps into People Analytics, the results are essential to help deliver an improved return on worker investments, moving on from broad-brush or gut-based approaches to staffing quality and issues. The move from ad-hoc or annual appraisals is a common factor across many businesses. The move to regular reporting, 360-degree feedback and other methods allow the business to gain better insights and more data points into how well the company is working and where there is non-judgmental room for improvement. A modern, forward-looking approach to performance reviews can make them less stressful for workers. It can normalize them, rather than being a dreaded time of the year, and make the results more actionable and meaningful for both workers and business leaders. Eager recruits will make a beeline for leading brands and companies with high values and a solid business reputation. Yet, all of these companies started out small and had to work their way up the ladder, suffering the ups and downs of any long-lived business. Creating, managing and expressing the brand of the business remains a key challenge to HR professionals, beyond the low-hanging fruit of LinkedIn and Glassdoor.com. However far along this process a business is, there is always time to refocus on the brand’s attributes and qualities to create a distinctive identity that will attract prospects to your culture. Remembering that however high-tech or automated your hiring process becomes, the personal touch is always more likely to win over a worthy hire. Massive buzzwords across all industries, AI and automation are rapidly being leveraged across the global HR market to attract, hire and retain the best talent. For businesses wading through large numbers of resumes, AI can help highlight the key points that will identify the right people to interview. Automated first-round interviews can help further identify the right people for the role, allowing HR to only focus on the key candidates from a large pool. AI is also being used to identify candidates for key disciplines where a role is not being widely advertised. For onboarding and workers, chatbots and virtual assistants are being used to help provide access to basic information and deal with illness, vacation and other regular tasks, allowing HR to deal with the more serious issues that require more attention. Developing best practices and learning how to cope with ethical dilemmas is a growing area for all HR teams within businesses. As is regularly reported, issues with business ethics can no longer be swept under the carpet or sealed behind legal agreements. The truth will always come out and damage the brand. From onboarding to the day they leave, workers up and down the corporate ladder must be trained to identify and correctly respond to ethical dilemmas, including handling confidential information, reporting abuse, inappropriate behavior, mis-selling and other areas. Workers will look to their managers and directors to lead by example and the company as a whole must be shown to be progressive and reacting correctly to any ethical dilemma. As the traditional nine-to-five or office-based role continues to decline, businesses must promote themselves as flexible and encouraging of patterns that meet worker’s lifestyles and adapt to the growing global talent pool. As businesses start to adapt and grow with talent from around the world, working different patterns and operating at plants in different locations, workers will expect tools that enable 24/7 collaboration and interaction with HR, whilst providing a balanced approach to terms and conditions, worker rights and so on. To address issues of sexism, ageism, racism and other weaknesses in recruitment, going blind enables businesses to eliminate these traits from the decision-making process. This process requires careful management and fairness in delivery. To that end, staff and management require training in the new approach and using tools in the right way to deliver a fair interview approach that eliminates bias. Changing the mindset and skill set of a workforce to make them more flexible, adaptable and liquid is creating exciting results among businesses looking to get the greatest value from their greatest asset; the workforce. Hiring staff with multiple skills, creating roles that will vary over time and encouraging the workforce to adopt new skills are all ways that HR can help build this liquid workforce to improve productivity, improve retention and make workers feel more valued.